Fact: The Internet loves cats. Cat videos, cat pictures, cat GIFs, whatever—as long as there's a feline involved, it's guaranteed that people will flock. 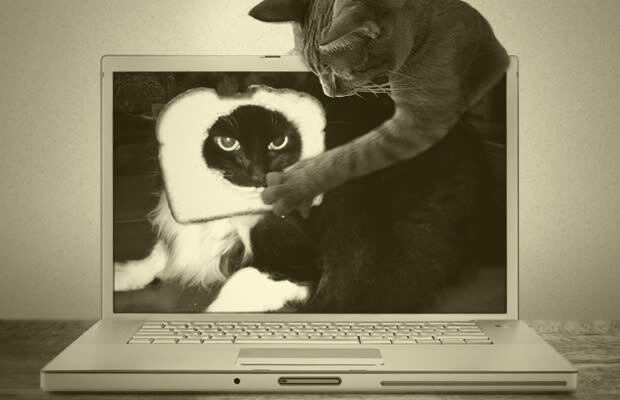 Though funny pictures of cats have been a fixture in pop culture for years (in the form of motivational posters, calenders, and greeting cards), the kitty obsession (relax, perverts) didn't become a true sensation until the creation of I Can Has Cheezburger? in 2007. The website was crucial in popularizing the whole concept of an Internet meme as well, so it's no surprise that now, five years later, Bravo approached the creators of the site for a reality series. Premiering tonight, at 11 p.m. EST, LOLwork takes a look what it's like behind-the-scenes at the Cheezburger offices. In honor of the premiere, we took a look back at The 15 Funniest Cat Memes Ever. Warning: If you're reading this at work, try not to squeal too loudly from all the cuteness.